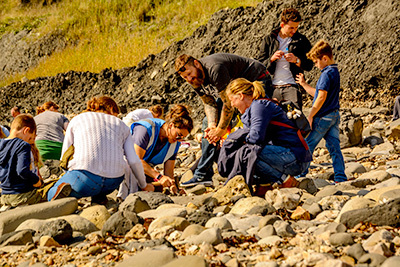 This two hour session starts up at the Centre with a 25 minute talk from the Centre Warden about the rocks and fossils of Charmouth and how to find fossils on the beach. The group then heads out onto the beach with the wardens and spends the rest of the session looking for fossils. Charges: £8 Adult, £4 Child (2 years and under go free). All children must be accompanied by a paying adult. Site information: Some uneven ground with sand, pebbles and boulders. Please be suitably dressed for the elements and wear footwear with a good tread. Dogs are allowed on the beach where we go fossil hunting, but they have to be kept on a lead. Unfortunately, dogs are not allowed inside the Centre for the 25 minute introductory talk. During the busy summer months booking is essential for the walks. We recommend that you arrive 10 minutes before the scheduled start time to pick up your tickets from the front desk. The times vary for walks as they are tide dependent. Please arrive at the Centre 10 minutes before the start of the walk to collect your tickets and have your introductory talk. After a 5 minute break we will head out on the beach to go fossil hunting with the wardens and our trained volunteers. 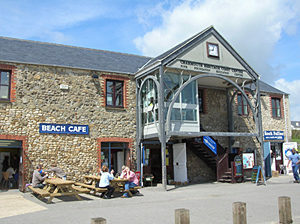 Charmouth Heritage Coast Centre relies largely on donations from visitors and friends. Please make a donation by clicking the button below.